The inaugural WWE Evolution will come to you, live on the WWE Network, on October 28 from the Nassau Veterans Memorial Coliseum in Uniondale, NY. 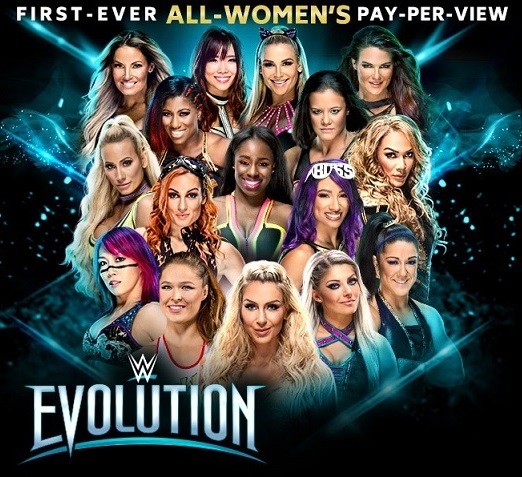 WWE Evolution will be the first all-women's pay-per-view in WWE history. so far the NXT matches and MYC finals are all I'm interested in. Corporate puppet vs Reality Television star, way to kill Ronda's Aura. Best match on the should have been the real main event. Really great chemistry between those two, but don't understand why Jessamyn duke interfered here. This was a dark match. Io Shirai vs. Toni Storm. Good match only got about ten minutes, I felt the shackles were to put on this one. Trish Stratus & Lita vs. Alicia Fox & Mickie James. Good match considering who was in it, and Bliss is supposed to have a concussion yet she was physical in this match. WWE logic for the ending of this one, The Rocks mom is sitting ringside she's Samoan, Nia is Samoan, Nia is related to Dwayne and Roman. Lets give it to her, instead of someone more deserving like Ember Moon. I thought that was a pretty good show! Crowd were hot all night which really added to the atmosphere. Best matches were easily the Charlotte Flair/Becky Lynch and Shayna Baszler/Kari Sane ones - both were excellent. Although I didn't really think there was a bad match all night. I thought they might do some kind of 4 horsewoman tease at the end with a Baszler/Rousey face-off but since Cole mentioned it a few times, I should have guessed it wasn't going to happen then!